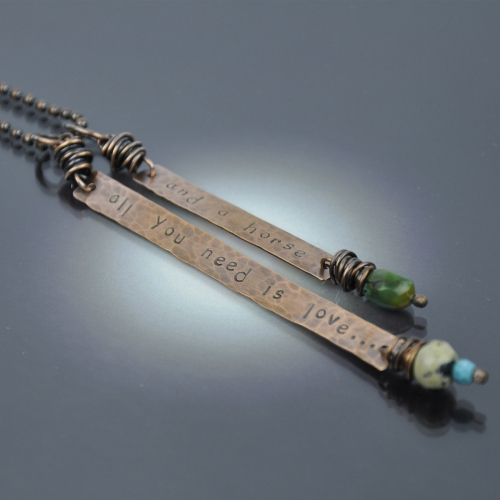 A 2-part pendant, with the first stating "ALL YOU NEED IS LOVE..." and the second, "AND A HORSE." From the pieces hang beads in turquoise and dalmatian jasper. It hangs from a 24" copper ball chain, and it has had a patina applied by hand. 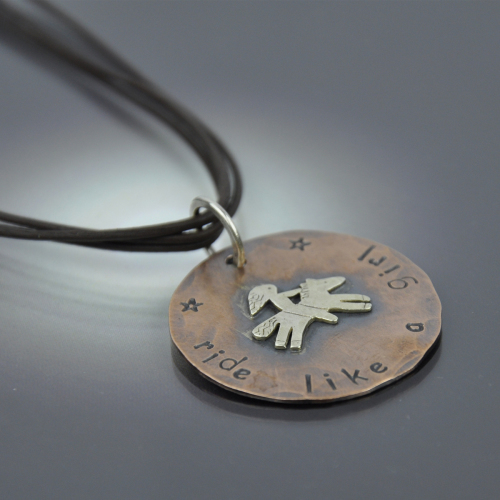 "RIDE LIKE A GIRL" is hand stamped onto a 1-1/4" copper disc with a sterling horse with girl rider on it. It is hung on a 20" triple brown leather chain. 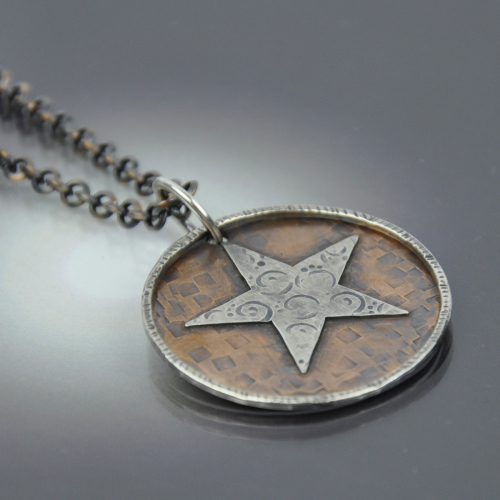 A sterling ring floats over a 1-1/4" copper pendant with a sterling silver star that has a hand stamped swirl texture. It is hung on an 18" copper chain with a push clasp. 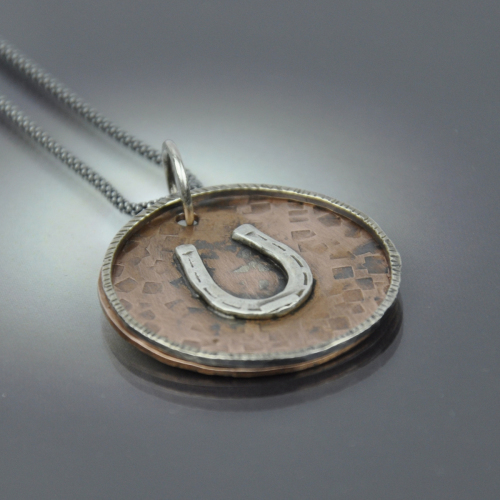 A sterling ring floats over a 1-1/4" copper pendant with a sterling silver horse shoe. 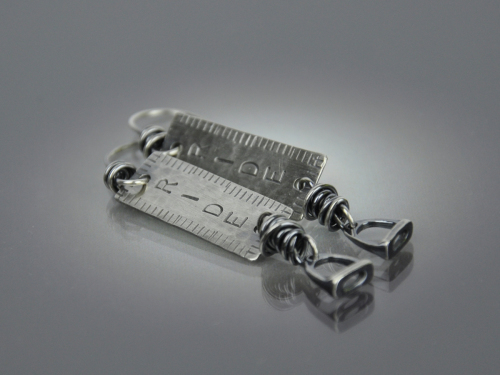 It is hung on a 20" sterling silver chain. 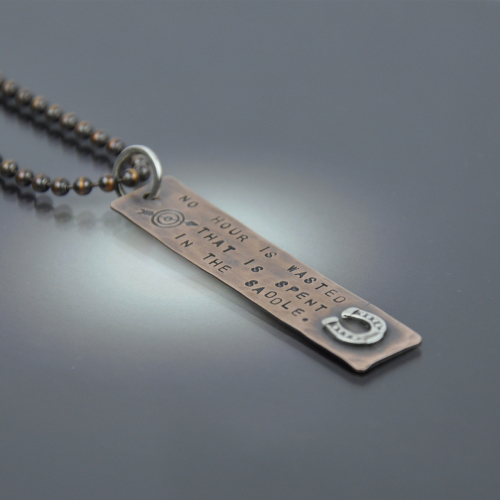 Copper pendant with a sterling horseshoe that is hand stamped with "NO HOUR IS WASTED THAT IS SPENT IN THE SADDLE, it is hung from a 28" copper ball chain. 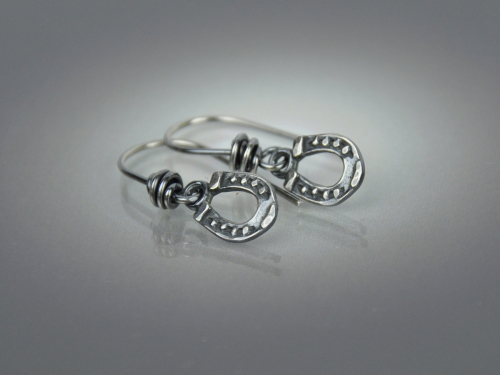 The pendant measures 1/2"w x 2 1/2"l.
Sweet little sterling silver horseshoe earrings. 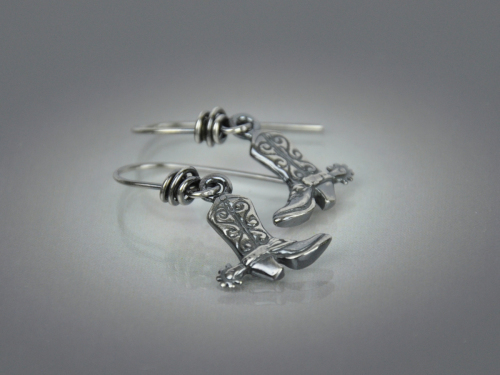 All earrings are finished with a hand wrapped sterling hook and a hand applied patina. 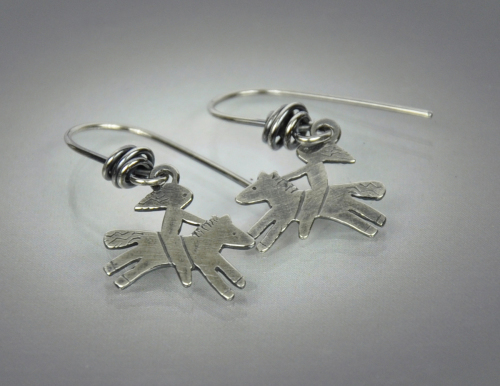 This funky little horse with a female rider makes up into a great pair of sterling silver earrings. Unique and light weight. All of my pieces have a hand applied patina, and are created by me in my MN studio.